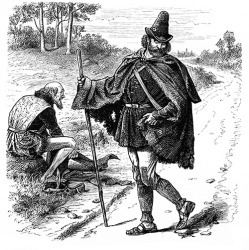 The story of Robin Hood was about a roguish hero who robbed from the rich and gave to the poor. The definition of roguish is dishonest or playfully mischievous. A con artist who steals money from unsuspecting victims is an example of someone who is roguish. A person who is playfully misbehaving is an example of someone who would be described as roguish. "roguish." YourDictionary, n.d. Web. 13 April 2019. <https://www.yourdictionary.com/Roguish>. Deceitful; unprincipled: Set adrift by his roguish crew, the captain of the ship spent a week alone at sea. Playfully mischievous: a roguish grin.